The search is on for outstanding HSMA Members who have demonstrated exemplary performance in sales and marketing in 2014. 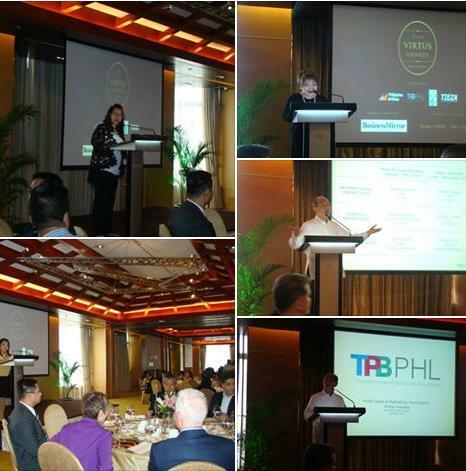 Awards are aimed at recognizing professionals who are doing a great work and inspiring others to follow their lead in setting gold standards in the Philippine tourism and hospitality industry. Virtus Awards will highlight industry leaders, allowing the wider tourism industry to learn from these best practice examples. Hotel Sales and Marketing Association International (HSMA) officially launch the competition last May 28 at the Diamond Hotel in the presence of Tourism Promotions Board COO Domingo Ramon “Chicoy” Enerio III, along with General Managers, Sales and Marketing Directors of member hotel and resort properties, including the media. Rose Libongco, Overall Chair for the Virtus Awards, shares “The Virtus Awards comes at a most opportune time. With the establishment of the ASEAN Community by 2015, the prioritization of the country’s travel and tourism industry opens a unique window of opportunity for local stakeholders to benefit from, as well as to cope with the challenges of regional integration”. The ASEAN tourism market is expanding steadily over the years, reaching 94 million in 2013. This figure is expected to go even higher with ASEAN Economic Community (AEC) integration. Philippines can capitalize on the high number of people crisscrossing the country. "The Virtus Awards aims to position Filipino sales and marketing professionals well in a wider marketplace as more properties open in the region and particularly in the Philippines", Libongco adds. Deadline of entries is set on September 15, 2015. Advocates of the travel and tourism industry, members of the academe and thought leaders in the fields of advertising, public relations, media and digital marketing comprise the panel of judges. Judging of shortlisted entries is set on October 15 followed by a "black-tie" gala dinner on November 27, which would be the pinnacle celebration of this year’s first set of winners. The said event is expected to attract nearly 500 key influencers in the tourism and travel industry. Visit http://www.hsmaph.com for more information on the 2015 Virtus Awards.